Content audit helps if you have a lot of content on your website. Is it possible that your content is hurting your site? Do you want to know what is dead weight and what is useful? In the process you will improve your search rankings and user experience! 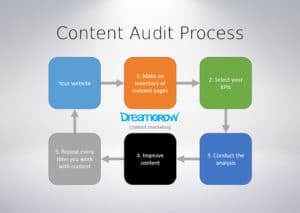 Content audit helps you to understand what how to manage and update your content. You will get a clear overview of your content. Clear understanding will let you decide what are the key assets to work with. You will know what content can be combined or redirected to other material. We will collect all the relevant data about your content. A complete list of the site’s pages. Articles, products, services, and other information posted on your website over its lifetime. We add data from your web analytics and server logs. Additional inbound link data will complement this. During the content audit, we analyze all the pages and find the ones that are most valuable. Those pages will become the core of your content portfolio. The process will factor in traffic from search engines and referrals. We add engagement metrics like bounce rate and time on page. Combining inbound link information with other content metrics helps us to sort pages into brackets by value. Automated recommendation algorithms classify the pages. The pages that need attention will be flagged for review. Content quality – we take a look at quantitative data how visitors interact with your content. Search engine performance – sometimes even poor content can rank well in search engines. What content has search visibility? Where do visitors land after they click? How to improve the content experience? Backlinks – identifying the pages that are well linked. Flagging the low value content where you can redirect incoming links to higher quality resources. Conversion rates – using your website’s conversion data to make sure the best content gets the most attention. We will prepare the content audit with your team to get access to all necessary data. We will crawl and analyze all the data and provide initial raw data report. Algorithms will classify the results of the initial data collection results. Manual review of the flagged pages. Our process identifies the areas where your website lacks content. We will also point out pages with quality issues. The analysis includes a preliminary UX and UI evaluation. Report points out potential problem areas where you can improve content presentation. Do you need content audit? The result of the content audit is a recommendation on how to modify your existing content to maximize the value for your business. After you receive the results of the content audit, we will give you an action plan. The plan will cover step by step how to improve the content portfolio and results of the website. Do you have thousands of pages to sort out? Hire us for content audit!